8355 Polyester Film, Double Sided Filmic Tapes, Solvent Acrylic Adhesive, Red Filmic Liner. Designed to provide strength and dimensional stability to weak foams and gaskets/die cuts. 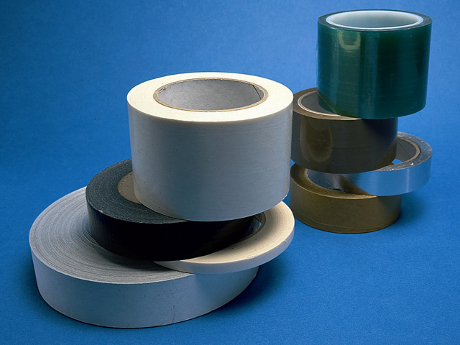 These tapes will help prevent stretch and may increase the tensile strength of a final construction. The film has the added benefit of providing a chemical barrier to plasticizer and oils etc, which over a period of time may affect the performance of the adhesive. Four films are available, Polypropylene, Polyester, Polythene and PVC with Polyester providing the greater strength. All available in various gauges and colours upon request. 8355 is the highest temperature category with Polyester Film.